Bring home automation to your house with Z-Wave's mesh wireless network. Each Z-Wave module is designed to let you wirelessly control your home's lights, appliances, temperature and more, all from a remote control, your computer, or from any device on the Internet, including a smartphone or tablet. The GE Remote turns on and off and adjusts the brightness level of Z-Wave-enabled lights, as well as Z-Wave-connected small appliances. You can create and manage custom lighting schemes by controlling up to 18 individual lights, 18 groups, and 18 scenes. 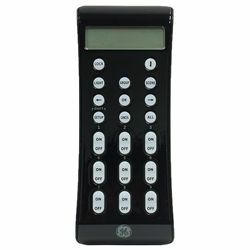 The compact, ergonomic remote uses a backlit LCD to provide visual feedback of completed commands. Not a compatible controller for Mi Casa Verde systems.